Panasonic's LUMIX DMC-GF1-K is a solidly built compact camera that lets you use different lenses. It's capable of capturing beautifully clear images and it's fast. It does have some issues when focusing in dim lighting, and noise is noticeable at high ISO speeds. Panasonic's LUMIX DMC-GF1-K is a compact, easy to use, and definitely stylish D-SLR–like camera. It's based on Micro Four Thirds technology and is available with different lens kits. One kit includes a gorgeous 40mm, f/1.7 pancake lens, while the other includes a 28-90mm zoom lens. It's a camera that's designed for serious enthusiasts who want a smaller-than-usual camera that will accept multiple lenses. However, even those of you who want to upgrade from an advanced compact camera might want to consider it. Previous attempts by Panasonic to create a compact Micro Four Thirds camera — such as the LUMIX DMC-GH1 — resulted in slightly bulky units that belied the technology inside their body. The Micro Four Thirds system has been primarily designed to allow for smaller D-SLR–like cameras to be created, and with the GF1 Panasonic has finally got it right. The Panasonic Lumic DMC-GF1 has a sleek looking body that is not too much bigger than a compact camera (it’s approximately 11.7cm long, 3.6cm thick, and 7.5cm tall), and its metal body feels very solid. The layout of the camera is logical and all the dials and buttons are in positions that make the camera comfortable to use. It can be likened to the Olympus PEN E-P1 camera, but without the throw-back design and with the addition of a built-in flash (it also has a hot-shoe). If you were to choose a camera based on looks and build quality alone, the GF1 would probably come up trumps. In the GF1, you get a 12-megapixel, 4/3in Live MOS sensor, which sits just behind the lens. You can use the lens of your choice, depending on your light and distance requirements, and the lens you choose will affect the quality of your images (and the lightness of your wallet). Indeed, as is the case with most interchangeable lens format cameras, the lenses for Panasonic’s Micro Four Thirds cameras aren’t cheap! For our tests, we used Panasonic's 14-45mm (28-90mm in the 35mm equivalent) G VARIO 1:3.5-5.6 kit lens. This lens has a manual focus ring, a zoom ring and built-in Mega O.I.S. (mega optical image stabilisation). It's not the best lens available, as it is a little slow and has limited capability for close-ups (it won’t shoot closer than approximately 10cm from a subject), but it gave us a good idea of the type of images the GF1 can capture. And they are quite good. The most noticeable trait of the GF1's photos is their clarity. The camera produces crisp and clean images that can be heavily cropped or used to print enlargements. 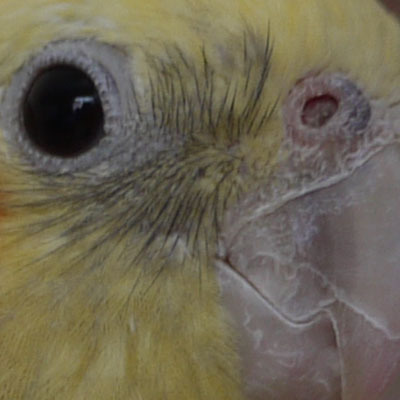 You can see from the following pictures of the bird how clean the image looks when zoomed in on his little face. There aren’t any issues with fringing nor is the image blotchy. Close ups and large prints will have excellent clarity, as long as you don’t use a high ISO value. However, it will only produce clean images if you use a low ISO speed. Anything above ISO 800 will introduce a lot of noticeable noise and, unless you're shooting in black and white, it probably won't look good. You can see the noise in the image of the pencil below. 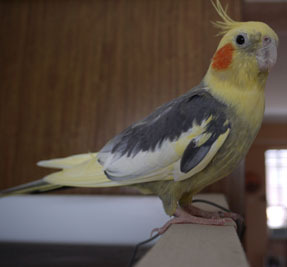 It starts to become noticeable at ISO 400; by ISO 800 the colour starts to change, and by ISO 1600, the image looks feathered and white speckles are present where there should be solid colour. If you will be shooting in an automatic mode it is a good idea to set the ISO limit to 400 or lower, unless you don’t mind the noise. From left to right: ISO 200, ISO 400, ISO 800, ISO 1600. When paired with an image-stabilised lens, the GF1 can give you blur-free shots down to 1/5th of a second without a tripod, as long as you can keep your hands very steady. This will come in handy when shooting indoors.